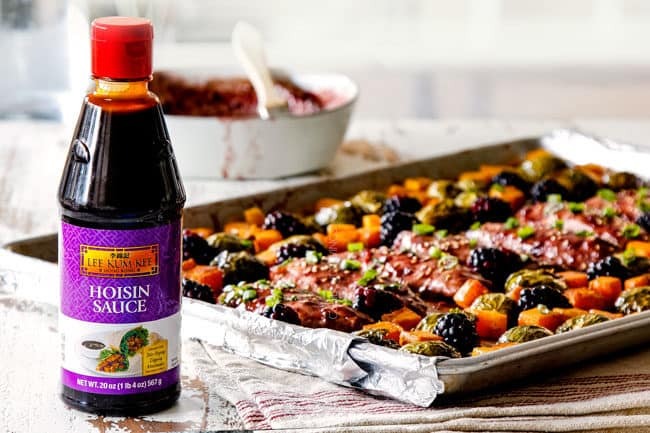 Sheet Pan Blackberry Hoisin Chicken and Vegetables is smothered in a lip-smacking tangy, sweet and spicy sauce with an Asian flair that all cooks in one pan! 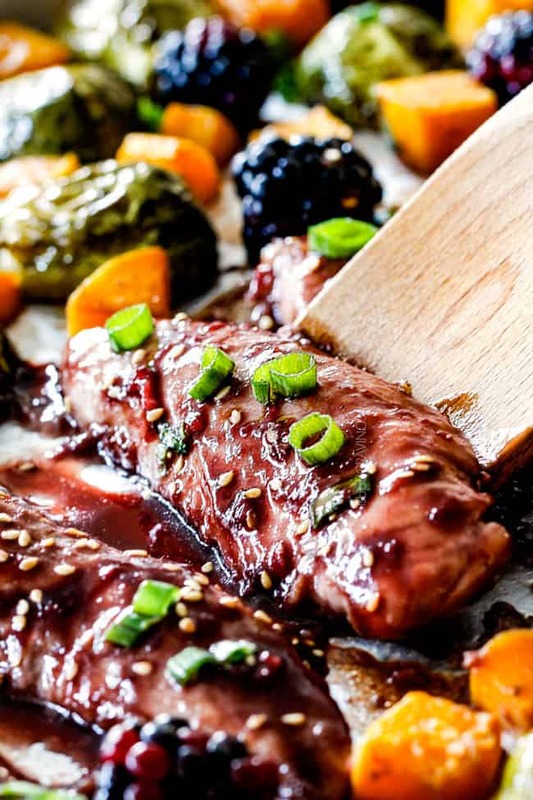 This Sheet Blackberry Hoisin Chicken is quick and easy with a marinade that doubles as the sauce for no extra work! 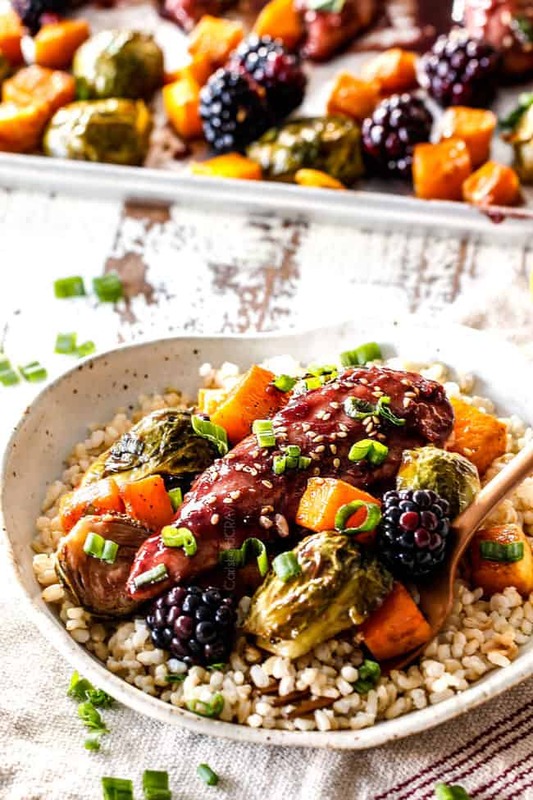 The blackberry hoisin marinade/sauce is irresistibly delicious with a customizable punch of heat for juicy, multidimensional chicken. You can prep the entire dinner ahead of time and store in the refrigerator for a dump and cook dinner that comes together in minutes. You can serve as is or add some rice, zoodles or quinoa. 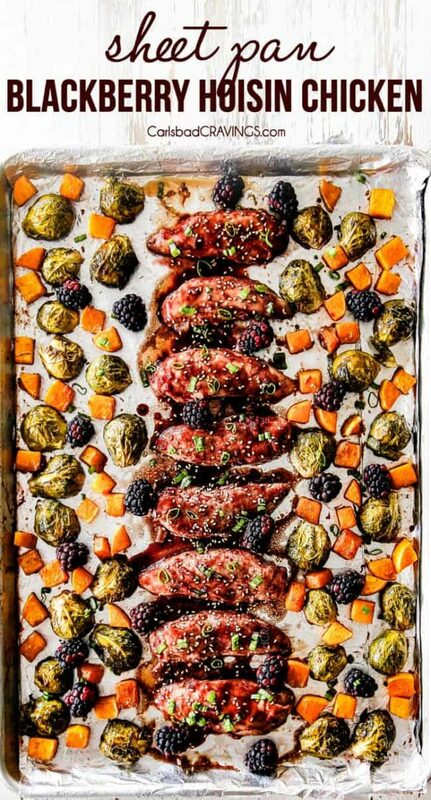 This Sheet Pan Dinner also makes fabulous meal prep bowls. 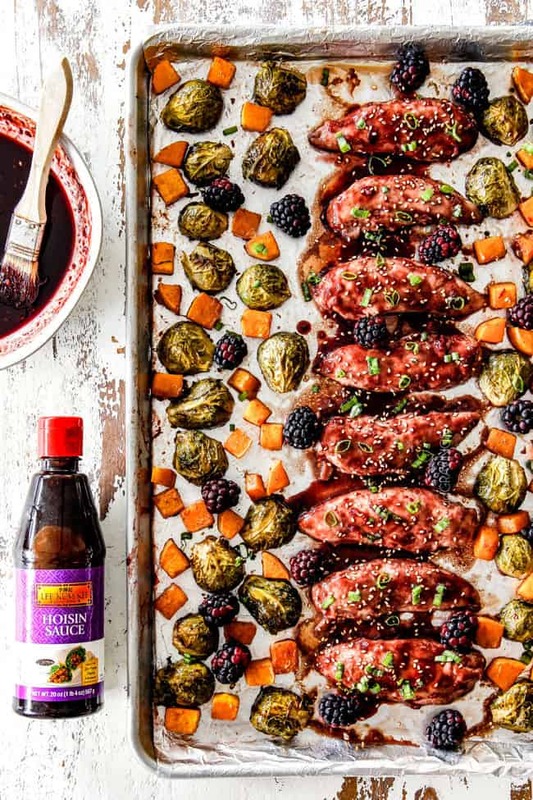 This Sheet Pan Blackberry Hoisin Chicken might sound fancy and taste gourmet but it is super simple to make! It is ideal for all those nights you don’t feel like cooking, or those hectic nights when you don’t have time for cooking, or for when you simply crave something DELICIOUS. It is not only quick and easy, but healthy, a meal-in-one, no hands on cooking, can be prepped ahead, and a snap to clean up! 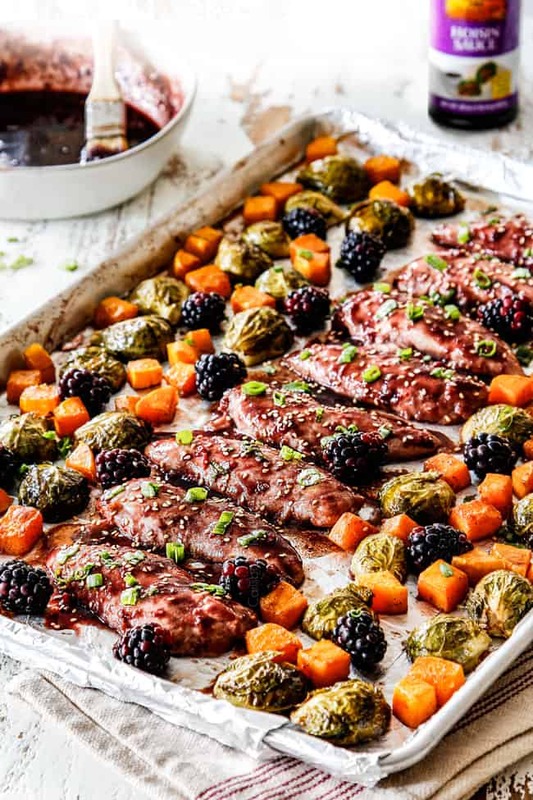 Even with all those stellar qualities, the real star of this sheet pan chicken is the blackberry hoisin sauce. 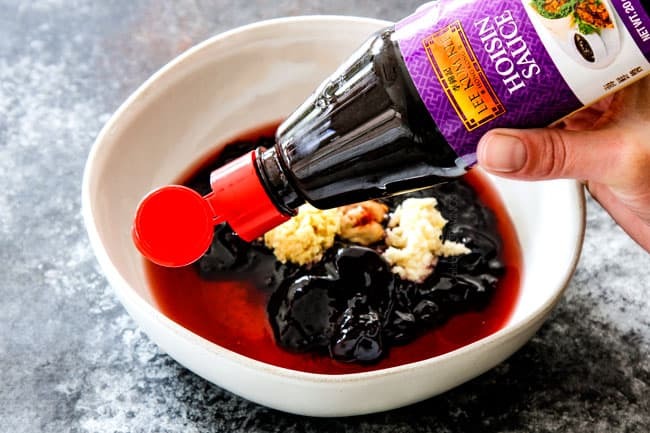 The delectable luscious sauce tastes of sweet blackberries with an underlying Asian flair, infused with hoisin sauce, garlic, ginger, Asian Chili Sauce and red wine vinegar. The sauce doubles as the marinade so the chicken emerges juicy, tender and flavorful – no dry, boring chicken here! 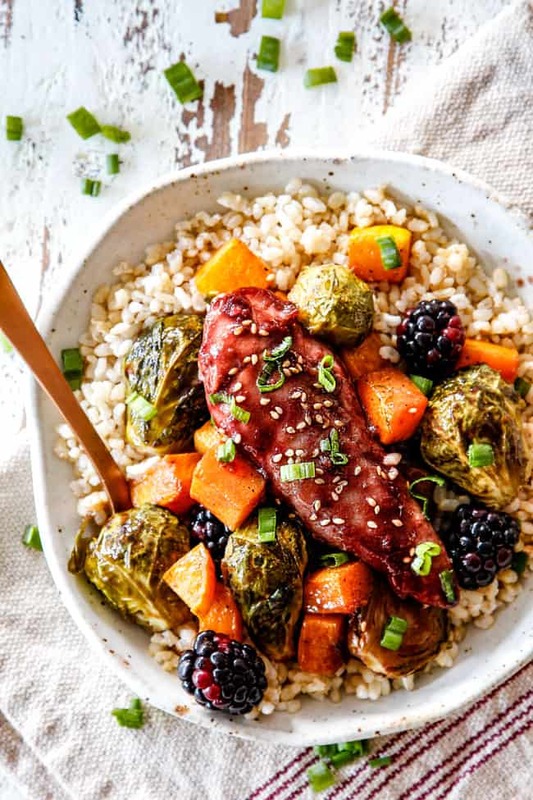 We also cook our chicken with butternut squash and Brussels sprouts that get tossed in a splash of sauce for not only flavorful chicken but veggies too – winning! If you aren’t familiar with hoisin sauce, it can be found in the Asian section of most grocery stores and I highly suggest you keep it stocked in your refrigerator. But please be aware not every hoisin sauce is created equal. High quality hoisin sauce, like Lee Kum Kee, tastes far superior than other hoisin sauces. I have been saying this for years, begging readers to use a high quality hoisin sauce because quality hoisin sauce makes a huge difference in taste. So when Lee Kum Kee approached me to partner with them, I was thrilled because they simply are the best – in my humble opinion. Lee Kum Kee Hoisin Sauce is an irresistibly delicious sweet sauce made from selected spices, soybeans and sweet potatoes. 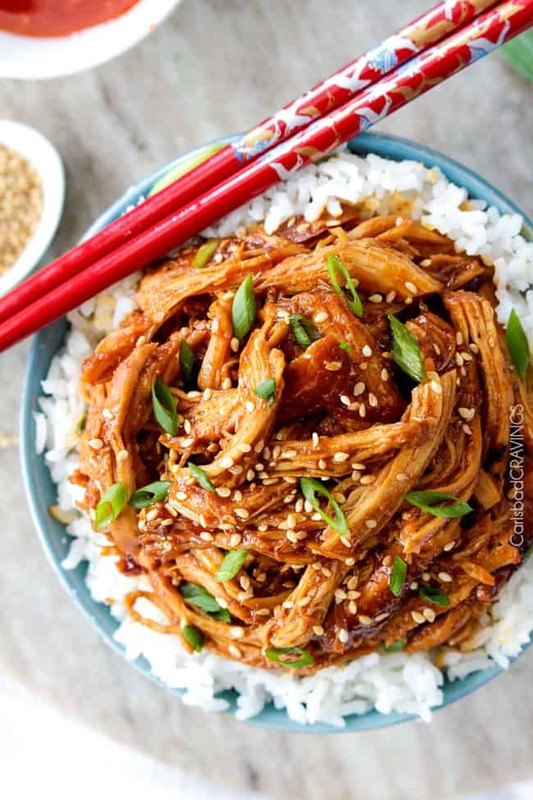 I have used it in so many of my recipes such as Hoisin Ginger Chicken Stir Fry , Asian Burger with Hoisin Ketchup, Mongolian Chicken, and many more. It is excellent for elevating weeknight meals and also makes a fabulous marinade like in my Beef and Broccoli. I love how Lee Kum Kee makes it so easy to create restaurant-quality Asian tastes and flavors at home, through its wide range of savory Asian sauces and condiments. With one taste, you’ll understand why they have been a leading maker of authentic Asian sauces and condiments for over a century. To that end, let’s celebrate Lee Kum Kee’s 130th anniversary! To commemorate the brand’s 130th anniversary, Lee Kum Kee is hoping to inspire chefs and home cooks to find unique and creative ways to incorporate Chinese flavors into their favorite dishes. Lee Kum Kee is hosting a 130th anniversary recipe contest for a chance to win a cash prize! Click here for more details. Whisk. 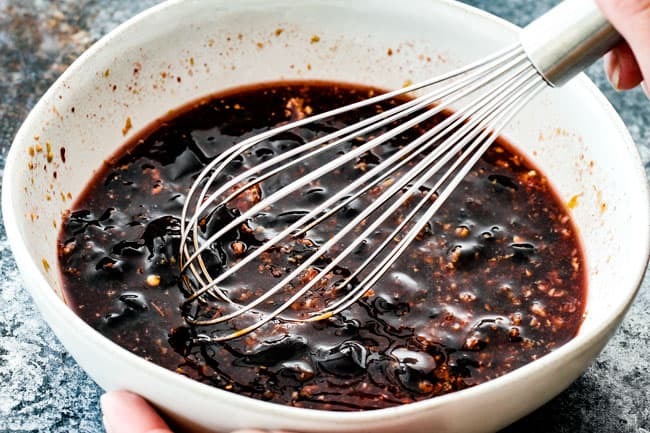 Whisk together all of the Marinade ingredients consisting of blackberry preserves, Lee Kum Kee Hoisin Sauce, red wine vinegar, Asian chili sauce, Dijon mustard, garlic and freshly grated ginger. Marinate. 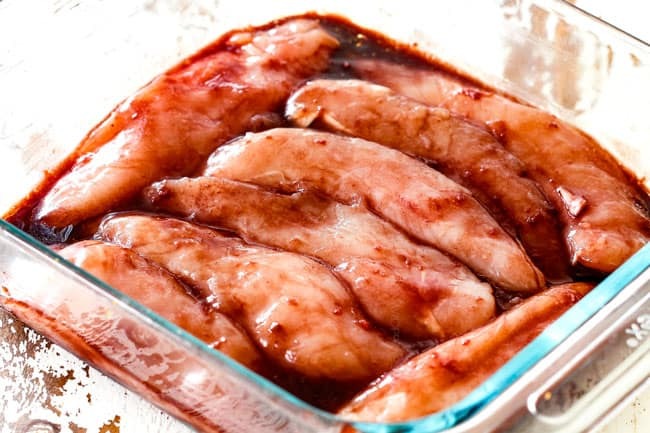 Add 1/3 cup marinade to a large freezer bag or shallow dish along with 2 tablespoons olive oil. Whisk together and add chicken. Turn to evenly coat. Marinate while you prep your veggies at room temperature or cover and refrigerate for up to 6 hours. Roast Veggies. 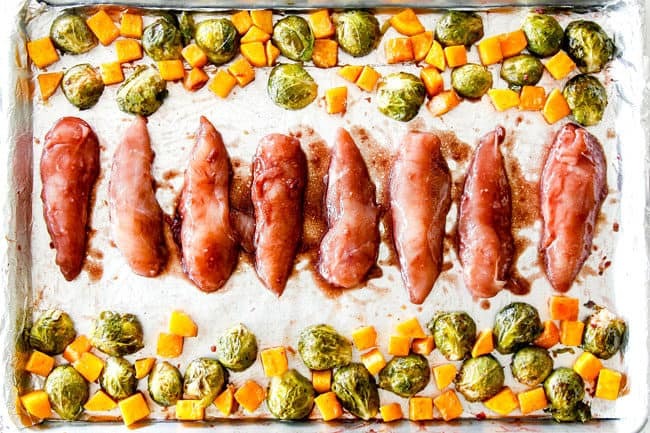 Add Brussels sprouts and butternut squash to a lightly greased foil lined sheet pan. Drizzle veggies evenly with olive and season with salt and pepper then spread in a single layer. Roast for 20 minutes. Add Chicken. 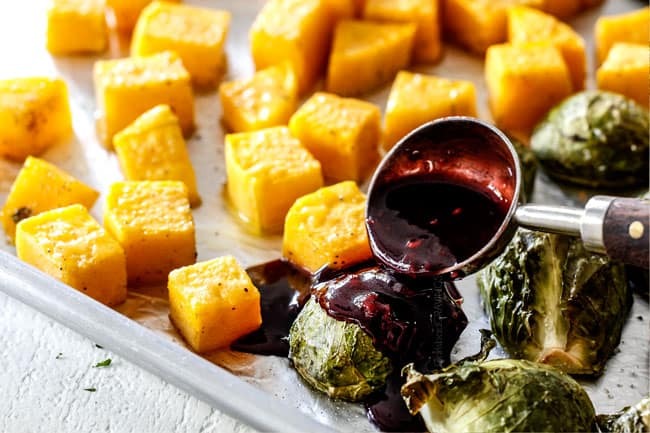 Remove pan from oven and add some of the reserved Blackberry Hoisin Sauce tot the veggies. Push veggies to the side to make room for the chicken in the center of the pan (keep veggies in a single layer). Add chicken in a single layer. Bake for 10-15 minutes (depending on size of chicken) OR until chicken is cooked through, and vegetables are tender. Sauce it up. Heat Reserved Blackberry Hoisin Sauce in the microwave. Brush chicken with reserved Sauce and garnish with sesame seeds and green onions if desired. Sheet Pan Chicken is delicious with rice/quinoa. Correct Pan Size: It is important to use a rimmed jelly roll pan which measures 15 x 21 inches. The size of the sheet pan matters because we want our ingredients to fit on the pan in a single layer without being overcrowded. If you don’t have a jelly roll pan, you can use 2 smaller pans. Easy Cleanup: Line your sheet pan with foil to make cleanup a breeze. Chicken tenders: You don’t have to use exactly 1 ½ pounds, so don’t worry too much about that. The important thing is to not overcrowd your pan – you want to give your chicken a little breathing room so it’s not touching each other. Can I use chicken breasts? Yes! Pound your chicken breasts to an even thickness and slice into 2-3 strips to create your own chicken tenders. Butternut Squash: Try and chop your squash uniform size so they cook evenly. If your squash isn’t tender when the chicken is cooked through for whatever reason then remove the chicken and Brussels sprouts from the pan and continue to cook the potatoes until tender. Mix up the veggies: You are welcome to use whatever veggies you have on hand, just be aware of the different cooking times and add them to the pan accordingly. Meat thermometer: No one likes dry chicken, so be sure to check it with a meat thermometer. If you don’t have a meat thermometer, I HIGHLY recommend you pick one up at your grocery store today, they come in so handy! If you don’t have one, then you can slice a piece of chicken to check for doneness as well, but the problem is you don’t know how long it’s been done. 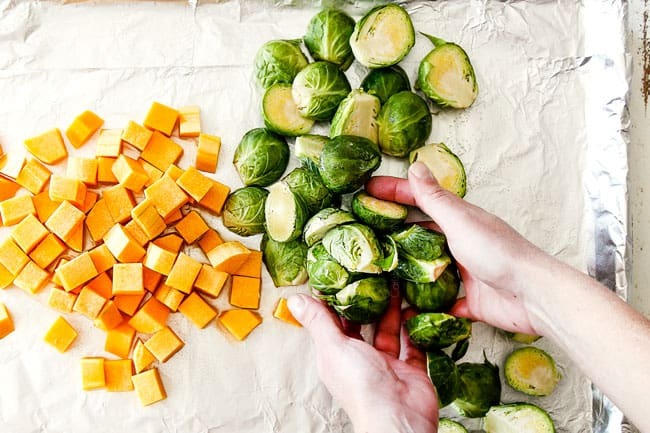 Prep ahead: You can marinate the chicken, trip and slice the Brussels sprouts and chop the butternut squash ahead of time so all that’s left to do at dinner time is to dump the ingredients onto the baking sheet and cook! Meal prep: Easily turn your Sheet Pan Chicken dinner into meal prep by dividing the chicken and veggies and optional rice/quinoa into sealable containers then top with remaining Blackberry Hoisin Sauce. 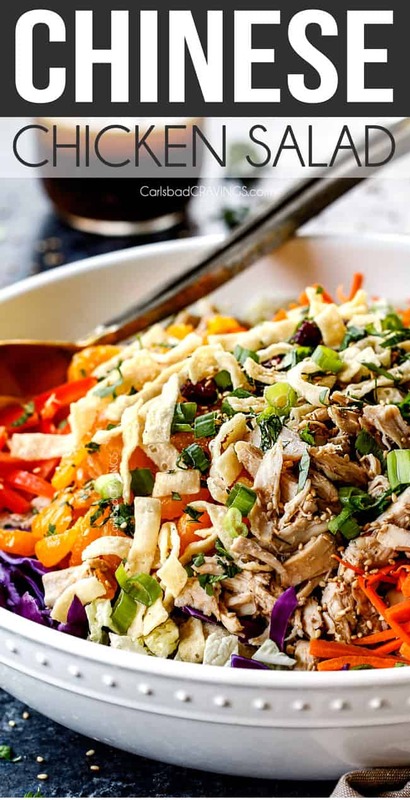 Want to try this Sheet Pan Hoisin Chicken? 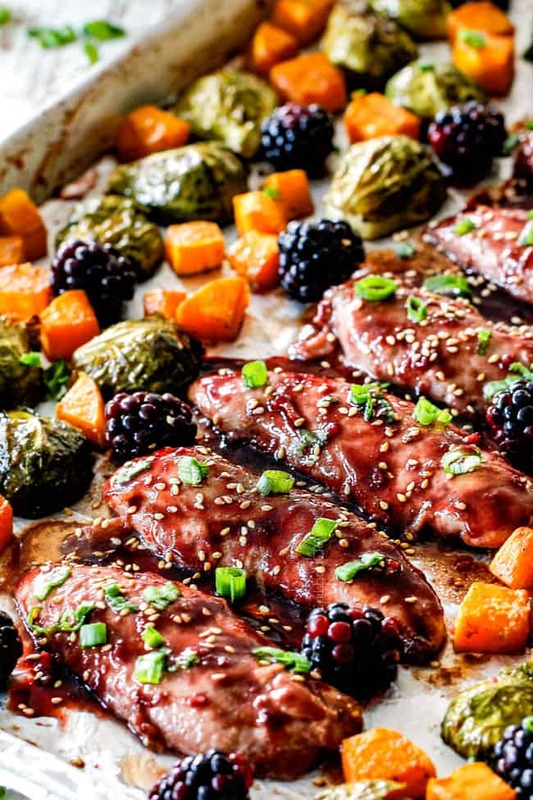 Sheet Pan Blackberry Hoisin Chicken and Vegetables is smothered in the most amazing tangy sweet and spicy sauce with an Asian flair It is not only quick and easy, but incredibly juicy, healthy, a meal-in-one, ZERO hands on cooking, can be prepped ahead, and a snap to clean up! Whisk together all of the Blackberry Hoisin Marinade/Sauce ingredients together in a small microwave safe bowl. Remove 1/3 cup and add it to a large freezer bag or shallow dish along with 2 tablespoons olive oil. Whisk together and add chicken. Turn to evenly coat. Marinate while you prep your veggies at room temperature or cover and refrigerate for up to 6 hours (the longer the more flavorful). Let chicken sit at room temperature 15 minutes before cooking. Cover and refrigerate remaining marinade/sauce separately. Preheat oven to 400 degrees F. Line a Jelly Roll Pan (15 x 21") with foil and lightly spray with cooking spray. Add Brussels sprouts and butternut squash to baking sheet. Drizzle with 2 tablespoons olive oil and ¼ teaspoon each of salt and pepper. Toss to evenly coat then line in a single layer. Turn Brussels Sprouts so the cut side is down. Roast at 400 degrees F for 20 minutes. Remove pan from oven and toss with 2 tablespoons reserved marinade. Push veggies to the sides to make room for the chicken in the center of the pan (keep veggies in a single layer). Add chicken in a single layer. Bake for 10-15 minutes (depending on size of chicken) OR until chicken is cooked through, and vegetables are tender. Heat Reserved Sauce in the microwave. Brush chicken with reserved Sauce and garnish with sesame seeds and green onions if desired. Sheet Pan Chicken is delicious with rice/quinoa. Looking for more Asian Favorites? Yes to Lee Kum Kee hoisin sauce! I didn’t think I liked hoisin sauce because I had tried other mediocre brands. If any of you think you don’t like hoisin – try lee kum kee! Hi Jen, your recipes never disappoint! I love how creative yet accessible this recipe is. It is going on the menu this week! Thanks for all you do to make me look good in the kitchen! Thank you so much for your kind words Shelly! 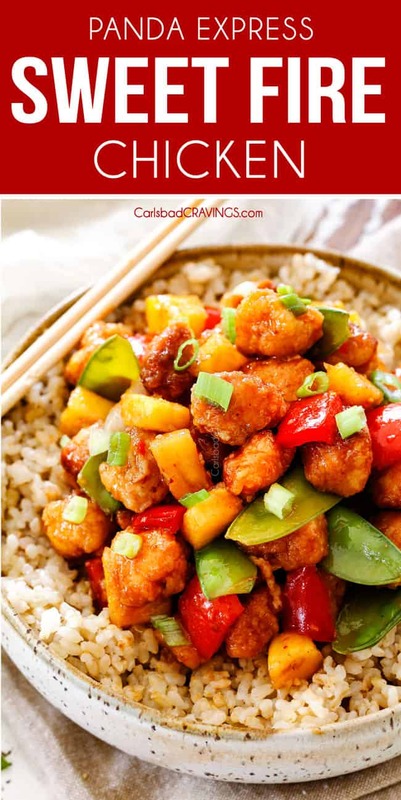 I’m thrilled your loving my recipes and I’m excited for you to try this one as well! Hi Jen, this looks wonderful! 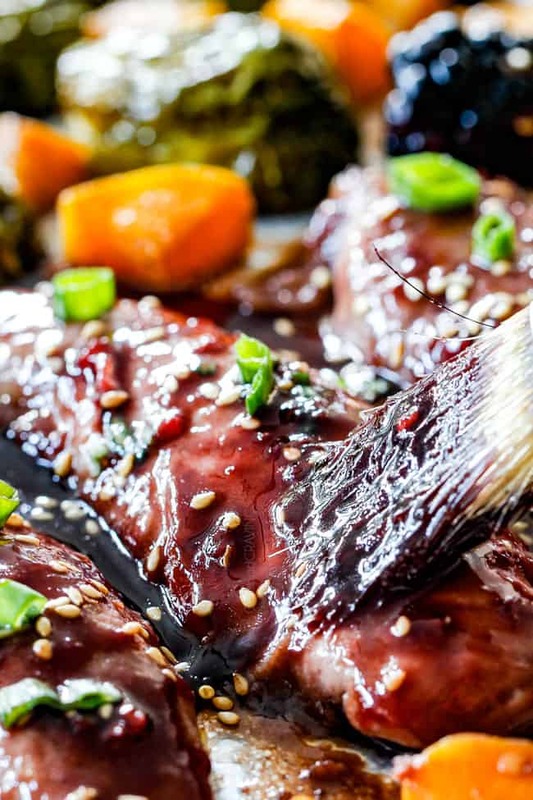 Your BlackBerry Hoisin Pork has been a favorite at our house for years. You taught me how to finally make a tender pork! I’m sure this is equally delicious. Will be trying soon. Hi Mary, I’m so pleased to hear you love my Blackberry Hoisin Pork! This sauce is very similar plus veggies so I think you will love it! I made the Blackberry Hoisin Sauce for salmon and it turned out excellent. It’s definitely a do-over. I LOVE the idea for this sauce for salmon, thanks Laura! I’m so happy you loved it!